Place on a cookie sheet and roast for about 4 minutes at 350F. Watch it carefully, it should smell fragrant when you pull it out. Process to a powder. Place into desired container. 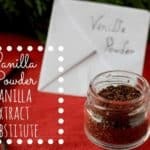 As mentioned above, use ¼ - ½ tsp vanilla powder for each tsp of vanilla extract in a recipe.